A deep, dark confession: Mr Magpie hates barley and I made this beef & barley stew despite his protestations. I was convinced that this was similar to many other things that he had eaten before and hated – the problem was simply that it wasn’t MY beef and barley stew. That sounds like my ego talking but it’s true in a lot of cases when it comes to Mike trying out food that he’s disliked since childhood. I swore that if he only would try MY Beef & Barley Stew that he’d love barley. Since I started this blog and started really learning how to cook I have won Mike over to the dark side of many foods. He hated Brussels Sprouts – until I make him crispy, oven baked ones like my Roasted Garlic Parmesan Brussels Sprouts. He hated turnip and loves my Roasted Olive Oil Turnips. I have a pretty solid track record when it comes to changing Mike’s mind about certain foods that he swears he doesn’t like. Not this time my friends, not this time. Barley is a cereal grain that belongs in the family of grasses. It is one of the most cultivated crops in the world, along with flour, corn and rice of course. To learn more you can head to GoBarley for more information and recipes! Is Barley Good For Me? It’s something that I just can’t comprehend, this not liking barley thing. That just sounds made up to me. Barley is amazing in soups and stews, it’s my favourite thing to add- and I’ve missed it for many years. You all know that now I have a half bag of barley sitting in my cupboard to use up – and I will be using it up. I’m planning on making an oxtail soup soon and it has barley written allllll over it. I guess that my son and I will eat it as my daughter has also inherited this crazy non-barley loving gene. Since barley takes quite a while to cook make sure that you chop your vegetables quite large, otherwise they can get too soft. You can omit the red wine and replace with a splash of red wine vinegar – which should be a staple in your pantry if you don’t always have red wine on hand for recipes. Basically if you are like me and drink the wine instead of cooking with it. Red wine vinegar is very good for you as well. You can add celery to this recipe but make sure to chop it large! To make this more of a soup, add 2-3 cups of additional beef broth. So here’s a recipe for the barley lovers. I chose to make a beef and barley stew instead of soup because I wanted this to be a real winter meal, the full meal deal for supper in the middle of this cold weather. We didn’t even really need the biscuits with the stew as a bowl of this was seriously hearty enough to be dinner. So who’s a fellow barley lover? Anyone else have a spouse like mine? 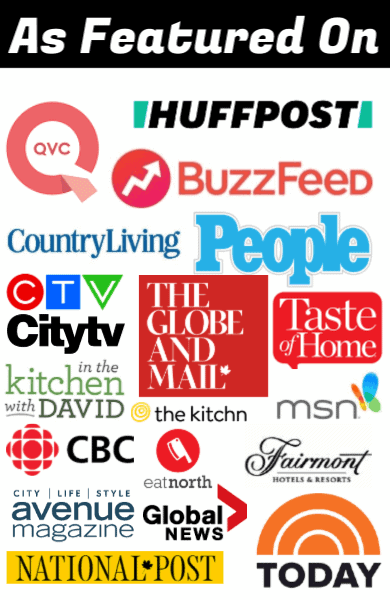 Pin This To Your Soups/Stews or Supper Ideas Board! 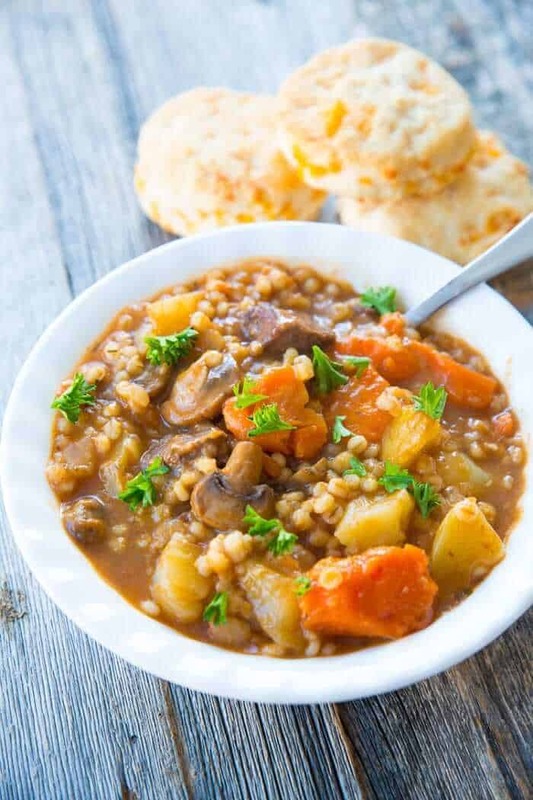 Hearty and delicious beef and barley stew, perfect for a comforting dinner at the end of the day. Make it in your Instant Pot or your slow cooker. Whisk together the flour, salt and pepper. In a large frying pan heat the oil. Add in the beef and fry until it's browned. Place in the bottom of the slow cooker. Add in the rest of the ingredients and mix until combined. Cook on low for 7-8 hours or on high for 3-4 hours. Serve with biscuits or garlic bread. Whisk together the flour, salt and pepper. Place the beef in the flour mixture and toss until the beef is coated. Shake off the excess. In the bottom of your Instant Pot, heat the oil using the saute button. Add in the beef and cook until browned. Add in the rest of the ingredients and then stir until combined. Use the soup button and cook for 30 minutes. You can either release the steam manually or let it naturally release, the choice is up to you. Stir and serve. You can also simmer this on the stove top until the barley is cooked and the vegetables are soft. This is amazing!!!! I personally am more of a stew, than a soup person. I cannot express how great this is. My husband really isn’t a barley person. Let’s just say 90% ended in his belly 😊😊 Making more today. Second batch in 2 months!! Thank you sooo much!!!! Made the stew in my new InstaPot & could not believe the wonderful flavour. Love the addition of barley. Four days later I am making another batch. Mmmmmmm! A rare Vancouver snow sprinkle: perfect timing for your stew recipe. Cheers! 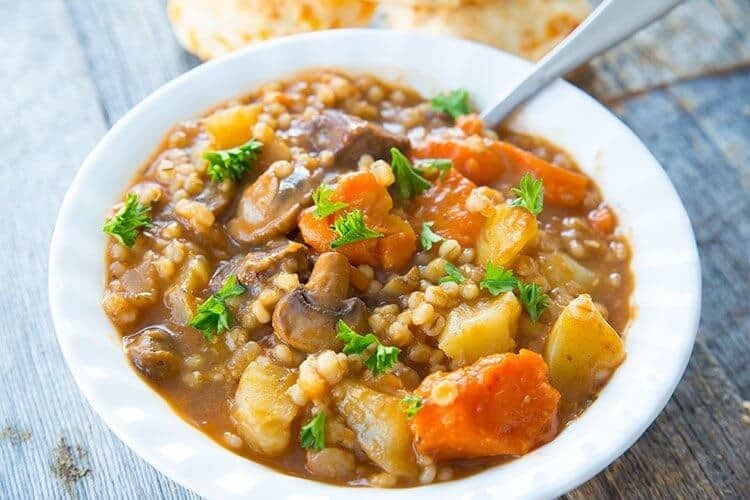 I love a beef barley stew & I too do not mind if the barley takes over. There are very few beef dishes I care for because I’m more of a chicken, seafood person. maybe Mike’s aversion to barley is like mine to stew meat. I have no idea how gristly it is today but eons ago when I was a child it had a great deal of gristle to it so I buy a small chuck roast & cut the lean meat in the roast into bite sized pieces & use that in place of the stew meat. There are only two of us so my IP is a 6 qt. but Gordon loves stews & soups & alas my 6 qt. is not big enough, so my 6 qt. will go to my daughter & Mom gets a bigger one because they are so time efficient & everything that cook in this comes out so delicious! I remember when I was a child in the 1940’s & my daddy’s mother always cooked her pinto beans in a pressure cooker. They were the most delicious beans! Mother would never use a presser cooker because she was always terrified that it would “blow up” on her. Pinto beans was the very first thing I cooked in my IP & they were heavenly, the taste was the very same in Ma’s kitchen when I was 8 or 9 years old! 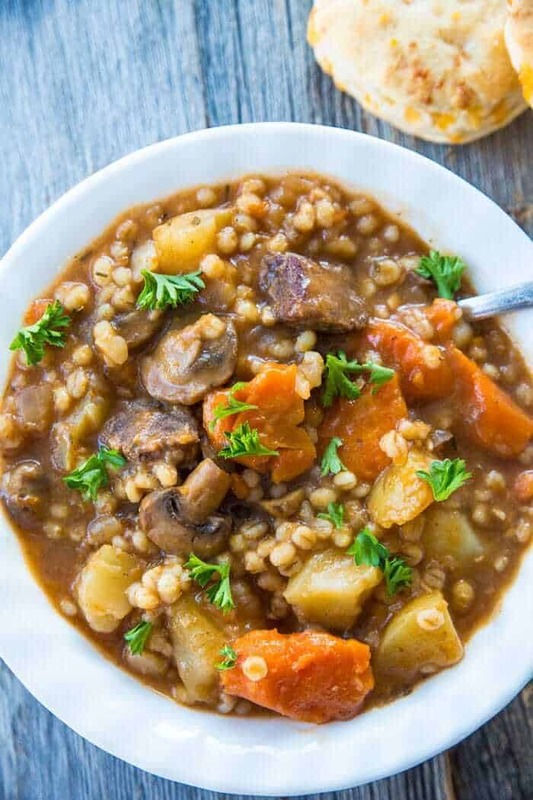 I love a beef barley stew & I too do not mind if the barley takes over. There are very few beef dishes I care for because I’m more of a chicken, seafood person. maybe Mike’s aversion to barley is like mine to stew meat. I have no idea how gristly it is today but eons ago when I was a child it had a great deal of gristle to it so I buy a small chuck roast & cut the lean meat in the roast into bite sized pieces & use that in place of the stew meat. This looks great! However, I’ve found that cooking barley and other grains IN the soup or stew, they seem to expand and take over! There’s only 2 of us and we don’t mind left overs or freezing portions. Any suggestions? Thank you! This is a really thick stew so I don’t mind the barley taking over but you can halve the amount of barley if you want less! Just made your stew tonight and it’s delicious, I love the thickness of the broth and The barley cooked perfect. The only problem I had is my carrots I cut them an inch thick but they came out really really mushy, I did it for 30 minutes on soup and I went ahead and let it completely naturally release I guess because of a bad experience I had with flour in a pressure cooker before. Could it be that I let it took too long I should have quick released? Any suggestions would be greatly appreciated. Everything else was delicious. This is my favourite go to recipe and it turns out great each time. Chicken works just as well as beef. I made this a week ago, forgot to add the wine,. It was awesome!! Martha and I ate on it. She loved it! Then my neighbor came over and we finished it off. He said it was the best stew he’s had. I used venison instead of beef. 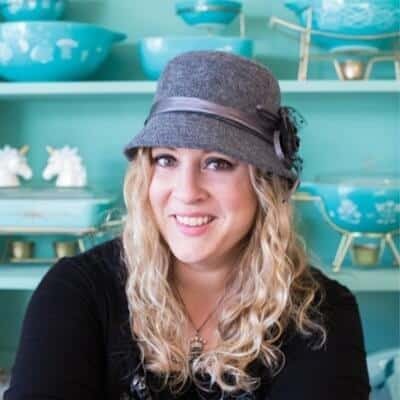 I use the 6 qt instant pot. So I’m making it again tonight, but didn’t forget the wine! That is awesome to hear and I bet the venison was AMAZING! Thanks for letting me know! I love beef barley stew. It’s my favorite. I haven’t tried it in my Instant Pot yet since I just got it recently. But I always have barley on hand so once I buy my stew meat I’m ready to go. This looks really comforting! It deserves a spot on our regular dinner rotation for winter! This comes together so easily in an IP. Such a hearty meal for when it’s cold outside! This stew is so fantastic! My family would love this for sure! I need to try this in my Instant Pot. It looks amazing! This is warming me up just thinking about it! There isn’t much more satisfying then a big bowl of stew! That barley is a great addition! What a fabulous stew! I’m a big barley fan, so I’m really in love with this! And I got an IP for Christmas, so this is on my to-make list! Loving all about this recipe. The fact that you are using barley is genius. I can’t get enough of barley lately. I love making stews in my IP! This beef and barley stew is going to be a huge hit here! I will definitely try this stew! Perfect! This stew looks so fabulous for dinner! I can’t wait to try it! This is my type of dinner! Perfect for this cold weather! Such a hearty and delicious stew!! Perfect for the cold weather! I got my first Instant Pot for Christmas! I am loving it so far, but need more good recipes! This looks like a winner!